Feeling nostalgic. Kind of. Remember when recipes were basically just a list of pre-packaged ingredients you could find at any grocery store: one 14.5 oz can of fruit cocktail, one box yellow cake mix, one box vanilla instant pudding, etc.? I appreciate the convenience of these kinds of ingredients. I appreciate the fact that their wide availability revolutionized the way we cook in our homes. I don't particularly like to bake using these kinds of ingredients anymore (with this notable exception). And, god knows, I mercilessly mock people who've made a career out of using these kinds of ingredients. But, BUT, they are great for young kids who are learning to cook. There's less chance of failure or less than desirable results, so it builds confidence in cooking ability while a child is learning techniques such as measuring, cracking eggs, etc. That's how I started out baking: packaged cake mixes, packaged brownie mixes. 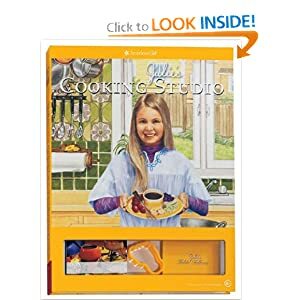 This American Girl (Julie) is from the 1970's, and the recipes in this book are "70's inspired". The Pistachio Cake recipe is original. 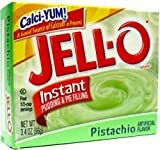 From when Jell-O first introduced pistachio pudding. Which, it needs to be said, doesn't taste anything like pistachio. This cake is sometimes called Watergate Cake, and the reason for that...is the stuff of urban legends. Go here to see some interesting history and original Watergate Cake recipes from the 1970's. I love stuff like that. For me, it was too sweet, too processed. BUT, Prima did it almost completely by herself (I had to help with frosting the cake--it's harder when you're using a loose, cool whip-y frosting), and she felt great about the result. It did make me want to come up with a modern version of it. One that actually tastes like pistachios. Of course, there's the Aunt Sassy Cake in BAKED: Explorations, which I fully intend to make this Spring. But I want something that is very light with a (real) whipped cream frosting, and is reminiscent of the Watergate Cake. Perhaps not so...green. Will add it to the list of projects to do. P.S. I sing the praises of silicone bakeware. I might have to start amassing my own collection (this one belongs to Prima). Oh man, I totally agree- I can't stand Sandra Lee. But I think the thing I hate is that she uses boxed mixes, canned products, etc. and pawns it off on people as "homemade." She's often cited on her show (the few times I watched it before I knew the truth) that "people will never know." To me, it's just dishonest. If you're going to cook from a box, fine... just don't say you made it from scratch.